#1. 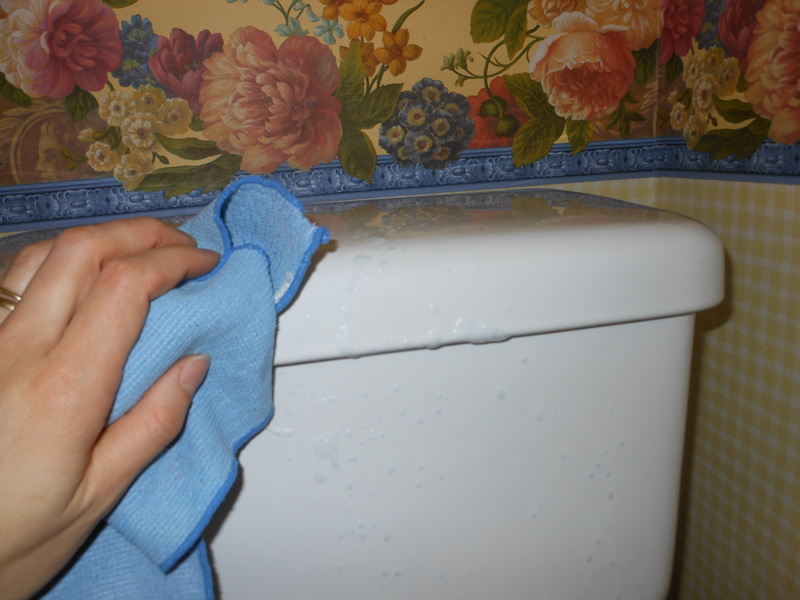 Use only Windex and a dry rag to clean your toilet and sink. That’s right, Windex. You know how sparkling clear it leaves windows. Why not use it to make your bathroom shine?! I read here that all you really need to keep under your bathroom sink as far as cleaners go, are Windex and a toilet bowl cleaner. I did some research to see if Windex is antibacterial, and basically found that ammonia, which is in Windex, can have disinfectant qualities, but that Windex itself is not considered a disinfectant. 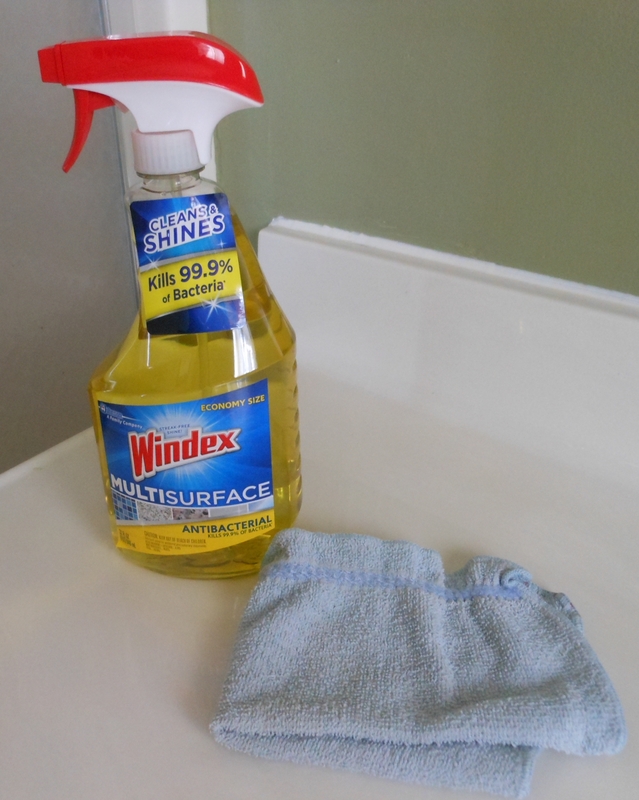 But I recently found Windex’s multi-surface cleaner, and noticed that it is antibacterial and it leaves my bathroom sparkling with the same shine that regular Windex does! And about that dry rag. . . I read here that the professional way to clean a bathroom is to spray disinfectant directly on to the toilet, sink, and tub, then wipe with a dry rag. It turns out that the wipe-with-water method I normally used is not so clean after all. Instead, the water just dilutes the power of your cleaner, and you end up spreading those germs all around as you wipe down that toilet! So I’m very happy to say that I now have a hassle-free way to clean my bathroom. It’s quicker and easier. And instead of streaks and smears with using water, I’m left with a clean shine! Spray the Windex on generously in short sections as you go along so that it doesn’t dry before you get there with your rag. Another hint: use a piece of toilet paper to wipe up the dust, hair, and other “grime” (mothers of boys know what I’m talking about! 🙂 ) that collects around the base of the toilet. Somehow all that stuff just clings right on to the toilet paper, and you don’t have to wipe it around with your rag. #2. 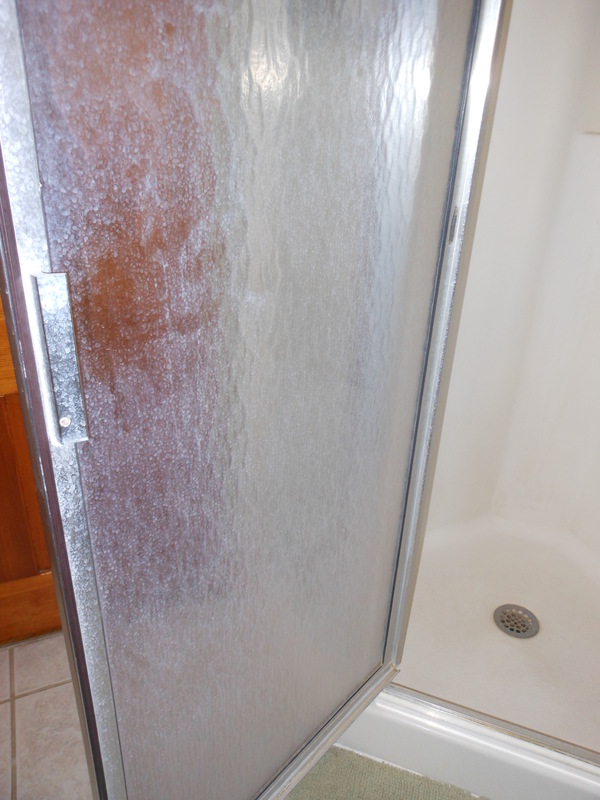 Use a sponge-wand filled with half Dawn dish detergent and half vinegar to clean your shower. 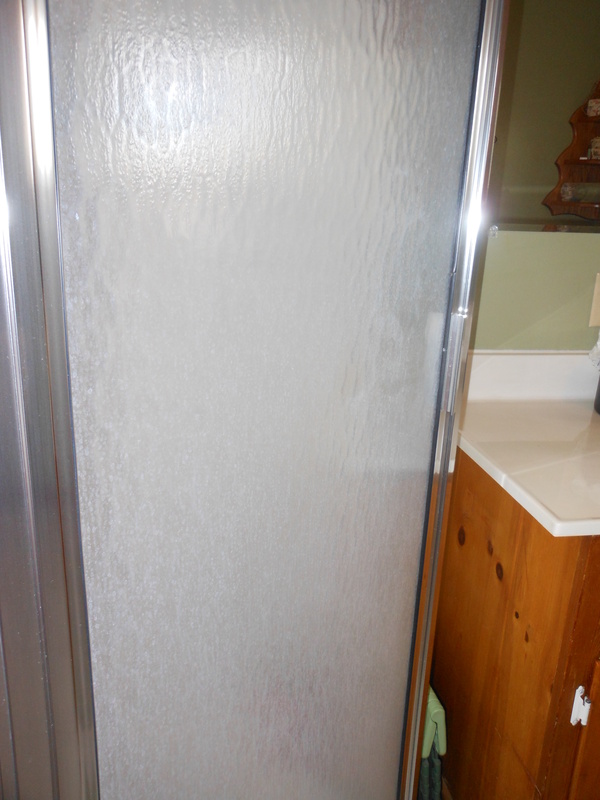 I’ve tried more ways than I care to remember to keep my glass-walled shower clean. Regular bathroom cleaners just don’t get rid of the scum. I’ve tried baking soda, and that works pretty well, but takes a good bit of scrubbing. 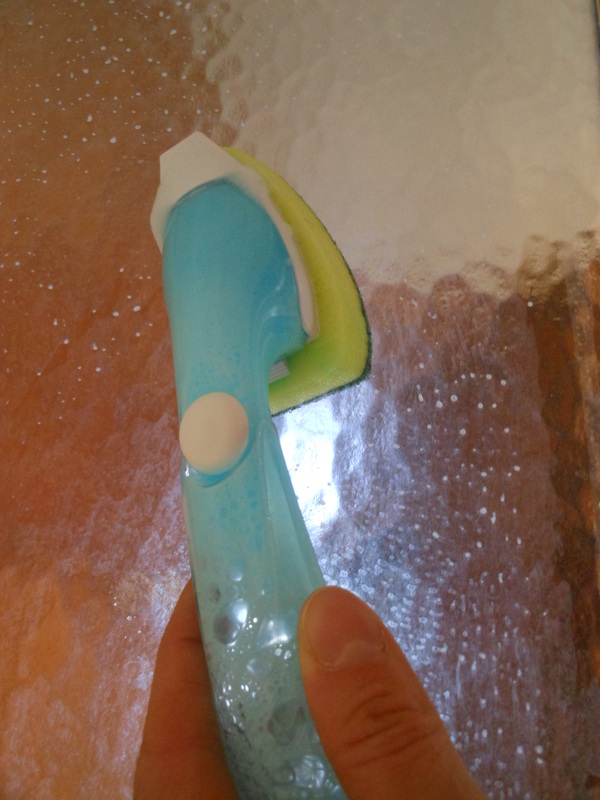 For a while, I had an automatic shower cleaner hanging over the shower head that sprayed cleaner all around the shower at the touch of a button. I just pushed the button as I was leaving the shower, and it cleaned the shower all by itself! That worked great until it died. We have hard water, and I think the build up on the gears inside the gizmo made it finally grind to a halt. So I’m really happy about this other Pinterest find. It’s cheap, quick, and easy. I actually do it while I’m in the shower myself. Dawn dish detergent and vinegar never hurt anybody! I try to clean my shower twice a week. One time I just clean the glass walls, and the other time I clean the whole thing. At the most, it takes me 5 minutes. And it really works! As I said before, we have hard water issues to deal with. We do use a softener, but that doesn’t completely resolve the issue. 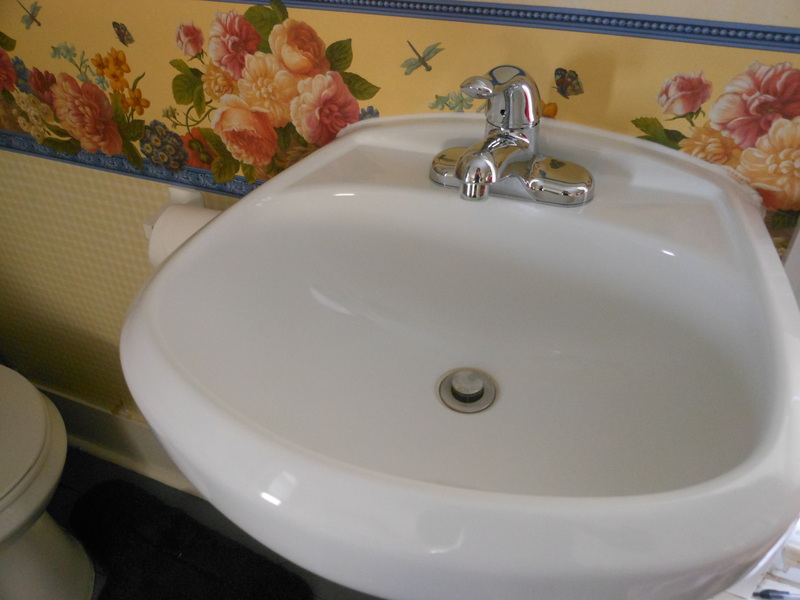 Dawn and vinegar really get rid of hard water stains and soap scum, let me tell you. Once again, I’m so happy to have found these quick, easy, and effective methods for cleaning my bathroom. You’ll have to give them a try! Very nice post here and thanks for it .I always like and such a super contents of these post.Excellent and very cool idea and great content of different kinds of the valuable information’s. I love Windex, too. I use it very often. My advice is to use essential oil after. Put few drops on a rag and wipe the bath. It smells fantastic. Best regards! 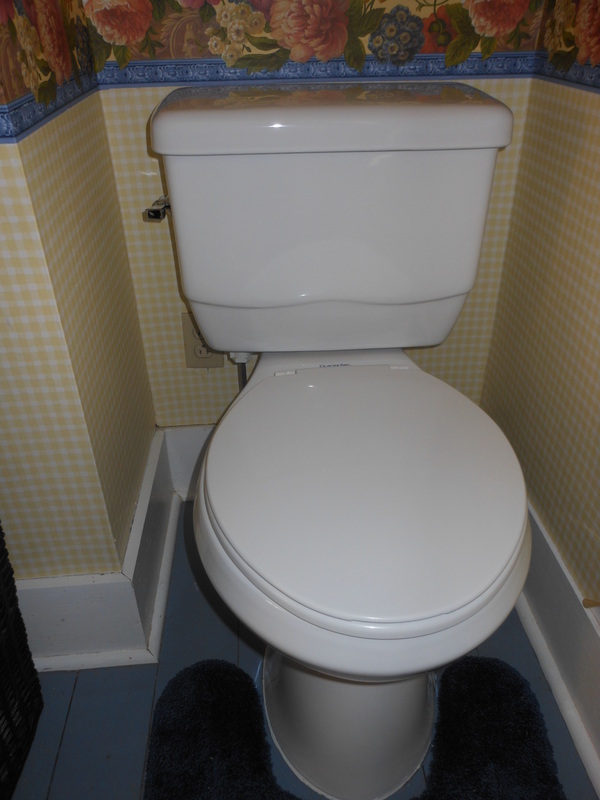 Your blog is absolutely fantastic way to clean bathrooms. Good work.Regards. Love the sponge wand idea. I have one of those kicking around. I must try this. 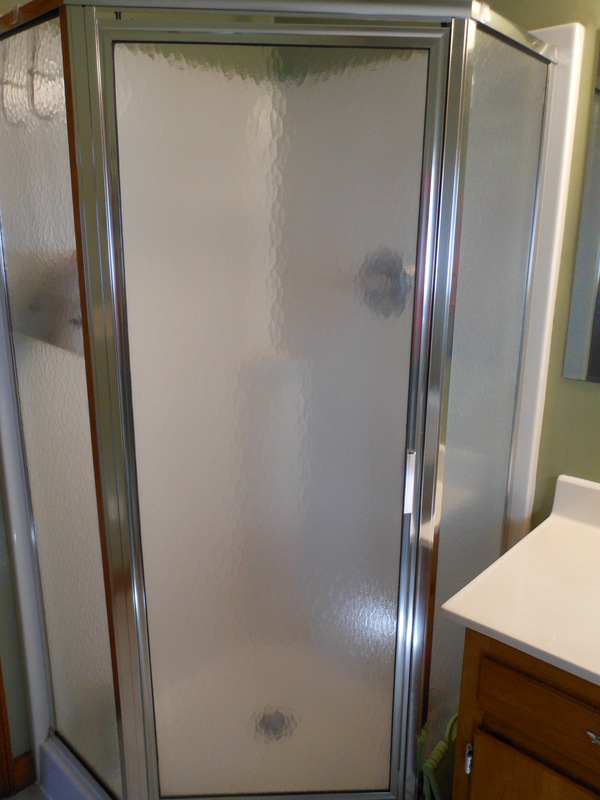 We have a glass corner shower in our master bathroom. We’re pretty good about squeegee-ing it down every time before we get out, but the hard water still leaves streaks. Does it work on shower inserts? I haven’t been able to find anything that cleans those entirely. Thank you so much for nominating me! How thoughtful! I love reading yours, too. You do a great job! 23 octubre, 20iCarist1n2Ah vale.. es que no veia conciertos por ningun lado, y he pensado que ya me quedaba con las entradas compradas jaja! Vale pues desde Valencia vamos, y alli nos veremos! Gracias! I’m definitely going to try the dry rag. I use Windex everywhere. Great ideas!